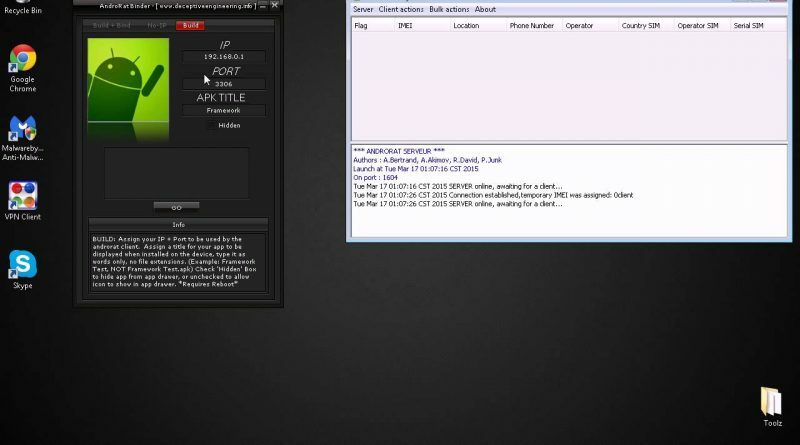 In this tutorial we are going to show you how to hack Android phones with Androrat. In our tutorials we only EVER hack our own systems as a proof of concept and never engage in any black hat activity. Step4: Download Androrat Binder and enter the Hostname and Port. Name the file and click Go. If you want to inject this file with another .apk file then go to Build + Bind tab name apk title and browse the location of the .apk and click Go. Note: THIS VIDEO IS FOR EDUCATIONAL PURPOSES ONLY! with is port in”Open Server tab on top and enter the port which you use on noip.com”? if we should have static ip adress? Good tutorial and you have explained it very well. But can you provide download links ? “SERVER online, awaiting for a client… ” and never change… what happen? i visit latesthackingnews (dot) com every day. I learned so many things with genuine and quality Information.. Thanks a lot.. At last I didn’t get that how we connected to other android device.